Paltrow's ex-husband, Chris Martin, came along, as well as their kids - 14-year-old daughter Apple and 12-year-old son Moses. "It's weird to think back on", Paltrow says in a recent interview about starting a new life following her divorce. 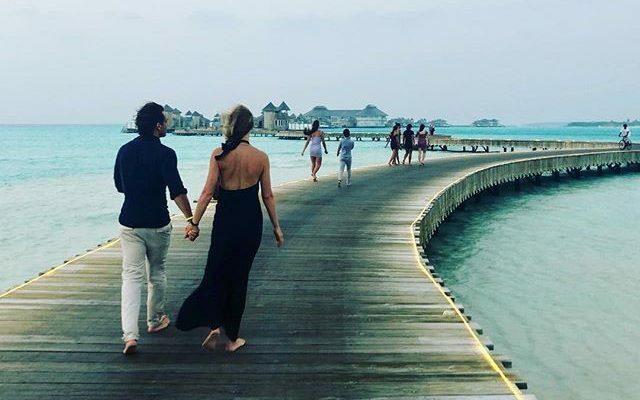 The Coldplay frontman, 41, who "consciously uncoupled" from the 46-year-old Hollywood actress in 2014, joined her, their children, TV producer Falchuk, 47, his children and a few friends for the post-wedding celebration in the Maldives over Christmas. "It was a very modern honeymoon", Paltrow said to the surprise of Kelly and Ryan. When Kelly found out that Chris was on the trip, she quipped, "There'd be so much crime scene tape at our honeymoon". 'So, my new husband and his children, my children, my ex-husband, our best family friends. "It was a very modern honeymoon", she said. "It was great, we had such a good time", she added. "We walked into a store the other day, and there was some really great song playing", she shared. Gwyneth Paltrow enjoyed a "big family honeymoon" with new husband Brad Falchuck and ex-husband Chris Martin. 'We just wanted to minimize the pain for the kids, ' explained the cookbook author. During her cooking-powered visit to Ray's show, Paltrow revealed that while "Apple is less" of a daring eater, Moses "loves to cook" and is her "little foodie adventure pal" both inside and outside the kitchen. The newly married star also discussed Apple's embarrassment over her mom during a visit to The Tonight Show Wednesday, telling Jimmy Fallon she doesn't quite "talk like" his "Ew!" character Sara-with-no-H, but her behavior isn't that far off.